It seems odd that tipping should have been so roundly despised by some Americans who made their way to England in the nineteenth century. Nowadays, Americans treat it as a “way of life,” although for many travelling overseas, the intricacies of how much to give and under what circumstances is often a source of great confusion. However, for Americans in the nineteenth century, it was often seen as a means by which the English enforced a class structure; a class structure that they found repugnant to their republican sensibilities. 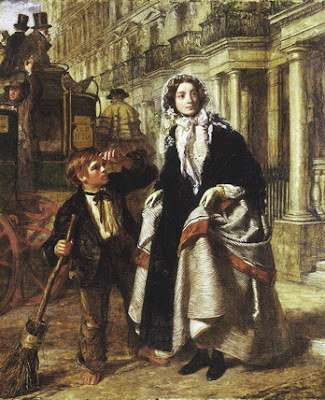 While tipping may have been frowned upon in nineteenth century America, and by Americans visiting the British Isles, it was very much a way of life in Victorian England. It seems apposite, therefore to question what it is that makes people tip. Dr Ofer H Azar has suggested that the two main reasons for tipping are “conforming to social norms and avoiding embarrassment.” While this may be true, it fails to come to grips with the question of why different countries and different social classes have radically diverse views on the subject. This is clearly bound up with questions of class and the economics of employment. Tipping is a peculiar phenomenon in that it usually follows the provision of a service for which the user (the tipper) has already paid and which he has enjoyed (or not, as the case may be). Indeed, this seems to conflict with the view that the term “TIP” was an abbreviation for the words “To Insure Promptness.” The person receiving the tip would appear to be hoping that by providing an exemplary service or through the general feeling that the potential tipper wants to avoid embarrassment he or she will receive this extra remuneration. Exemplary service may, of course, not just result in a tip, it may act as an incentive for the tipper to return to a particular restaurant or service; this rationale would, of course, only apply where the service is one which has a likelihood of repetition. Although tipping is never compulsory, there is a strong social expectation that it will be given, especially in those economies where employees are working for low wages. This is particularly true of service industries. More recently, in many places, a gratuity or a service charge is added to the bill, but that need not concern us in considering the Victorian Era. What, then was the tipping situation in Great Britain in the 19th century, and why did visitors from the United States object to the practice? The practice of tipping during Victoria’s years extended from the greatest houses to the meanest streets. Guests on hunting weekends expected to pay the servants who waited on them. By the middle of the century, this had become such an expectation, that a poor guest who did not give a sufficient tip might find himself abused by members of the household staff. At the other extreme, there were those like the crossing-sweepers described by Henry Mayhew for whom tips totaling a shilling a day would have been considered a decent return. This custom of theirs [tipping] is a great annoyance to strangers; for in addition to all your other cares on the road, you have to carry a pocket full of change. Better would it be to put every charge in the bill and make you pay at the bar. Thorburn was born in Scotland in 1773 and migrated to American at the age of twenty-one. In New York he worked as a nail-maker before becoming a grocer at which time he began to sell plants and seeds. He wrote extensively, if not well, and in October of 1833 visited England, by now a successful businessman. During that time and shortly thereafter, he wrote Men and manners in Britain; or, A Bone to Gnaw for the Trollopes, Fidlers, &c. Being Notes from a Journal on Sea and on Land in 1833-4. The Spectator of 21 December 1833, however, was far less kindly in its view of both the author and his work even suggesting that elements of it were written by others. But for us, the section on tipping and the frequency of the demands for gratuities is of particular interest. In the hotels, besides paying your bill at the bar, you are called on by -- sir, remember the waiter,-- sir, remember the chambermaid ; and also by a slovenly looking fellow whom they call boots. In the stage, perhaps you are drove from London to Coventry, or any other direction, to a distance of fifty miles. There you change the driver and guard, when you are again subjected to the same beggarly impositions -- sir, I have drove from London -- sir, I have guarded you from London. You may give as much as you please, but not less than one shilling to each. In fifty miles more the same beggarly farce is acted over again. Between London and Liverpool, 200 miles, I paid twelve shillings sterling to guards and drivers, besides three sovereigns stage fare. comes out to be sure ; his face as red as a northwest moon, corporation like a ten gallon keg, white apron, shoes, buckles and stockings, bowing and cringing like one of his well-whipped spaniels, but most roundly does he make you pay for all this servility ; and when you are going to leave his inhospitable roof, he sends after you a host of privileged beggars; and after you are seated in the coach, the windows on each side are beset with -- sir, I lashed your trunk -- mam I brought out your bandbox, &c. I was informed by several gentlemen, that the servants in hotels and drivers on the road had no other compensation for their services, only what they could in this way extort from customers. Clearly, this was an annoyance, not only to Thorburn, but to other travellers. Travel was difficult enough in the early days of Victoria’s reign, without the necessity of having to fend off those seeking gratuities for, all too often, dubious services. It was not long, however, before the ubiquitous practice of tipping reached the United States and it was certainly well established there by the beginning of the twentieth century and the end of the Victorian Era. To read or download a copy of Thorburn's book, click here. I received the following query and am posting it in the hope that the person who wrote the initial comment might follow up on it and contact Tony Gee. I am desirous of contacting 'Anonymous', who posted a comment about needing information on the black prize fighter called "Jem Wharton", following your 25th May 2010 blog, 'The Manly Art of Self Defence'. I am a prize ring historian and wish to inform him that there is a short chapter on Wharton in my recently republished book on the London prize ring, Up to Scratch. In addition I have information from newspapers which may interest him, and would also like to know more about the painting he mentioned.